In an effort to replicate the NAS experience its customers know and appreciate, Synology has made the RT1900ac interface eerily familiar. Accessed via any connected web browser pointed at router.synology.com, the operating system, dubbed Synology Router Manager (or SRM for short) is essentially DiskStation Manager (DSM) tweaked to meet the needs of a router. 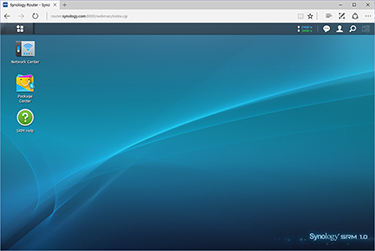 For a first-run product, there's a high level of polish and the interface looks and feels great. 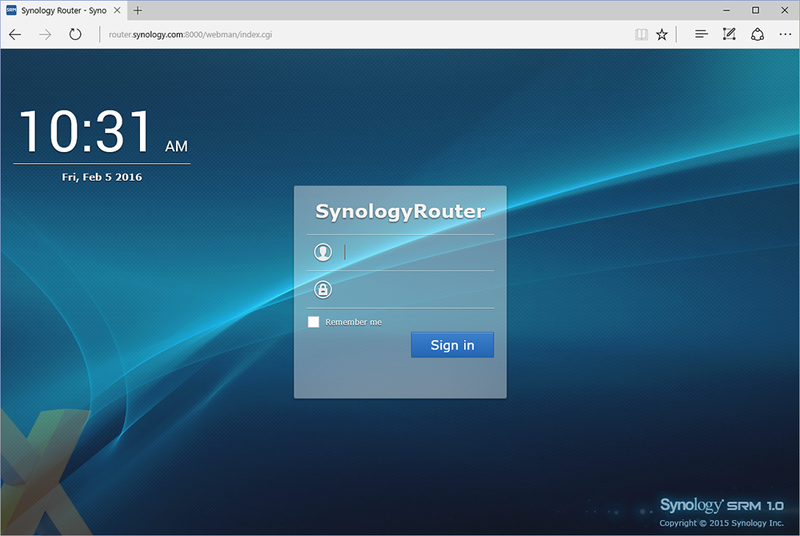 We'd expect nothing less from a Synology device, yet we're pleasantly surprised to find that the RT1900ac hasn't been rushed out of the door with a half-baked OS. It's an important point, and the fact that enthusiasts have developed a habit of buying routers only to install third-party firmware is testament to the value of a quality software environment. Setup begins with an on-screen wizard that prompts you to create a username and password, define a wireless network name and select an operating mode. 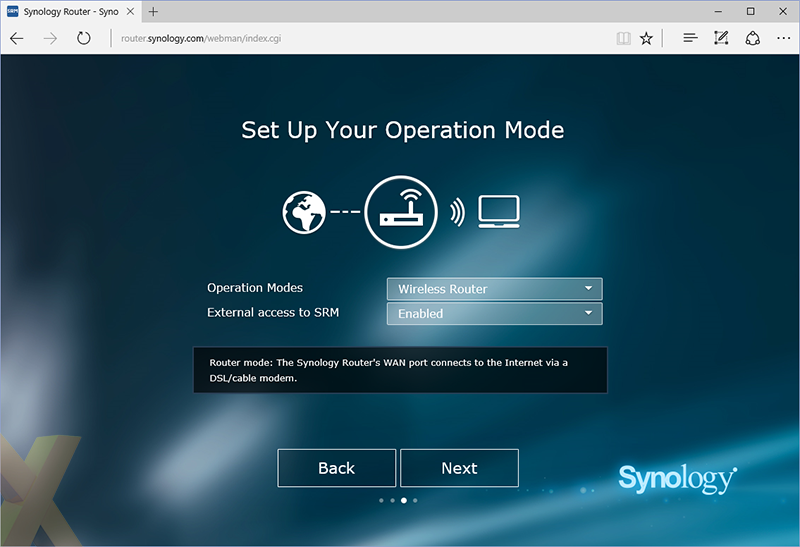 The latter lets you choose between having the RT1900ac function as a fully-fledged wireless router or just an access point, and the setup is for the most part simple and straightforward. The only potential complication is that you'll need ISP login/connection details for your external modem, and hands up, who knows their broadband username and password off the top of their head? 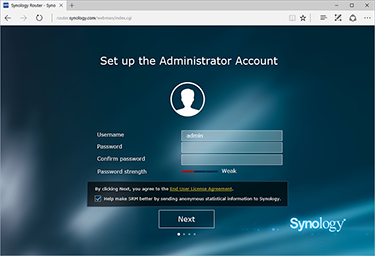 The setup wizard should take a matter of minutes to complete, and when it's done you're dropped onto the SRM login page. Presentation is top-notch and anyone who has used a Synology NAS will feel right at home. Indeed, login and you'd be forgiven for thinking you've accessed your DiskStation. 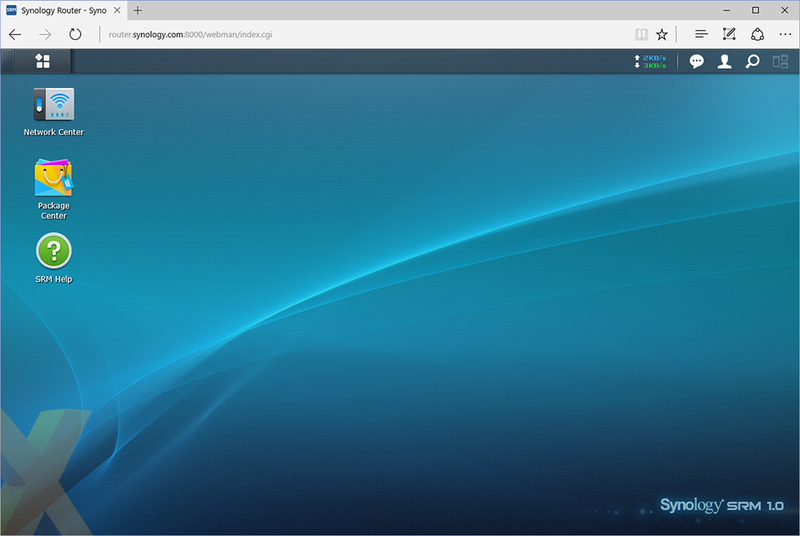 The SRM operating system employs a practically identical layout, with desktop icons, quick-access shortcuts in the top right and a Windows-like toolbar that remains accessible when multiple apps are open. It's an interface that works really well, and even at this early stage, you get the sense that established router manufacturers are going to have to up their game if they're to match what's on offer here. It doesn't just look pretty, either, as Synology has managed to include a good array of functionality in SRM 1.0. 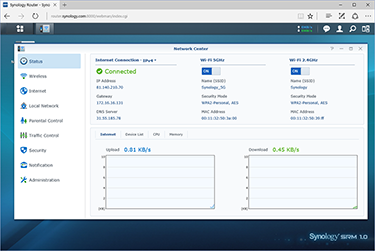 When it comes to router configuration, you'll spend most of your time in the easily accessible and well-laid-out Network Center. 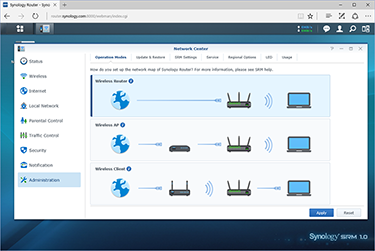 From here, users can configure both WiFi channels to suit their needs, and as is the case with most modern routers, there's also an option to create a guest network. 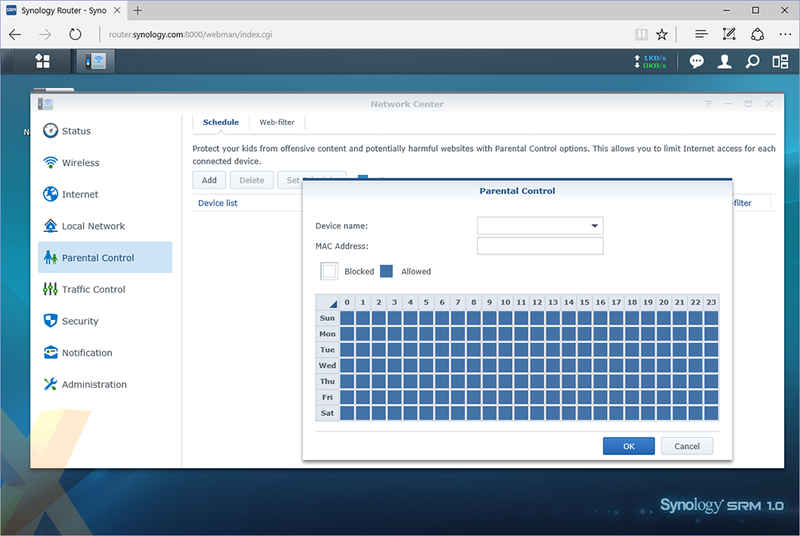 For the parents out there, we like the fact that Synology's Parental Controls are configurable on a per-device basis. Such features can be complicated on rival routers, yet SRM's implementation is easy to get to grips with. Web access can be limited using a time schedule for each individual device - a great way of making sure the kids aren't watching YouTube in the wee hours - and there's also a handy web filter. This can be used to allow access to a user-defined list of sites, or alternatively you can prevent access to known adult websites or a block list of your making. 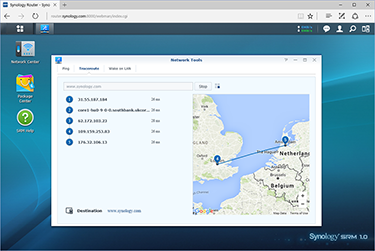 Continuing the good work, Synology also presents traffic control in a manner that encourages the user to get involved. 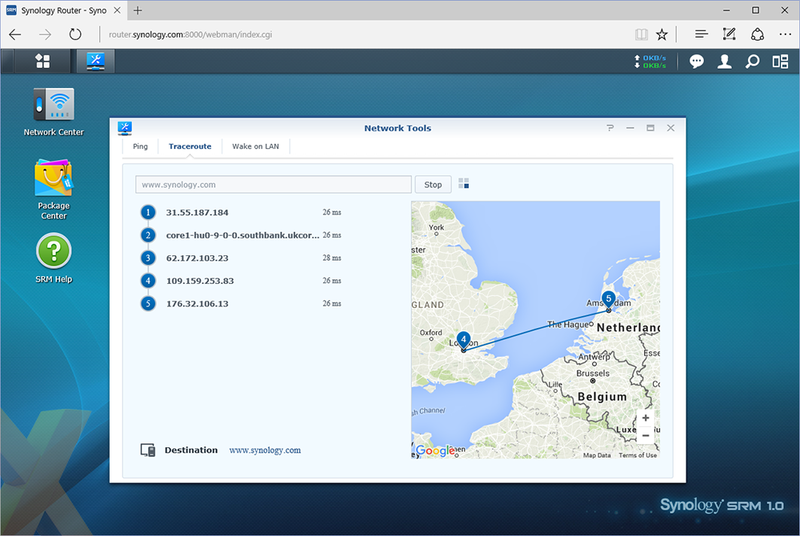 Setting device priority is a cinch, as are bandwidth limits, and the on-screen graphics do a good job of bringing your data usage statistics to life. Beyond the core configuration options, SRM 1.0 also includes a few added niceties. We like the fact that the on-device LEDs can be turned on/off using a time schedule, automatic software updates work the same way as they do on a Synology NAS, and a built-in Security Advisor app is helpful in checking your configuration settings align with the manufacturer's recommendations. 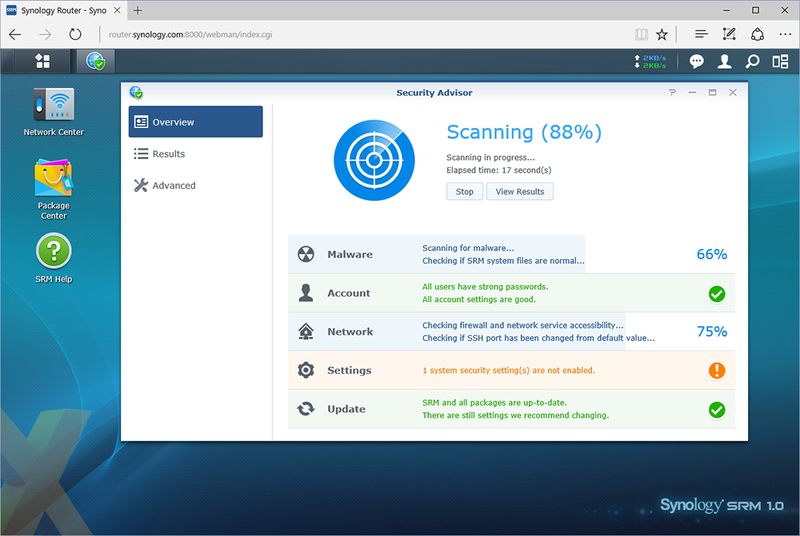 Synology's elegant software is what makes the RT1900ac shine. 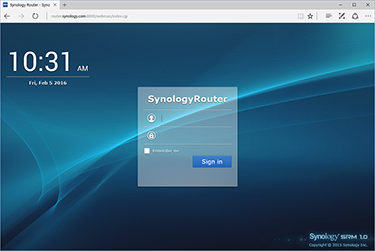 Attach a USB 3.0 drive to the router's available port and file sharing is configured using a File Station app that's not too dissimilar to a Synology NAS, meaning easy-to-manage shared folders and a good amount of configurability. There's also plenty of scope for other usage scenarios via the built-in Package Center (i.e. app store). 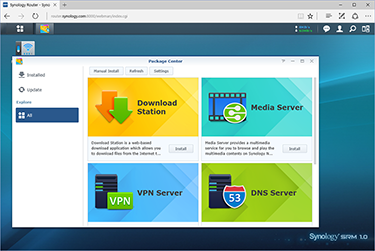 There are only a handful of in-house-developed apps at this stage, including Media Server, Download Station and VPN Server, yet they all hold promise and there's surely more to come. 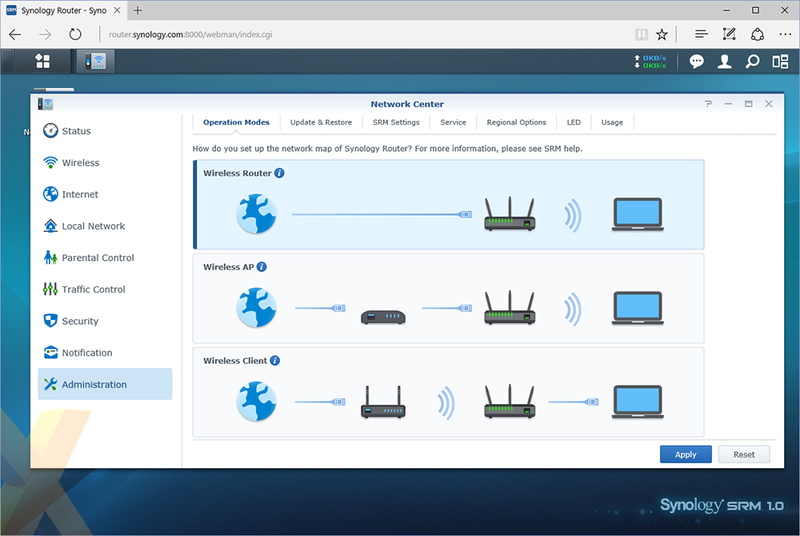 The software, in a nutshell, is a key selling point, however there are signs that Synology is still learning the ropes with regards to router functionality. A quick browse through SRM's release notes reveal that a number of significant issues have been fixed in the months following launch, and while it's good to see updates being rolled out on a frequent basis, these are issues that may not exist on well-established competitors.